First, Peyton Manning is no doubt the most popular citizen in the Volunteer State. (He has a home near Cleveland ... Tennessee, not Ohio.) He is a Tennessee football legend, a two-time Super Bowl Champion, and a five-time winner of the NFL MVP Award. In a few years, he will no doubt be in the NFL Hall of Fame. Second, it is no secret that Peyton is a Republican. He was the keynote speaker at a Republican Congressmen’s retreat at Philadelphia earlier this year, and has been a long-time supporter of GOP candidates. Third, he is not controversial. He stood for the National Anthem at every football game during his 22-year long NFL career. In recent years, he has frequently been mentioned as a potential candidate for Senator in Tennessee, Louisiana, Indiana, and Colorado, and probably in the other 46 states as well. His position actually makes a lot of sense. Why would Peyton Manning become a United States Senator when he can reign as one of the most powerful private citizens in America and never be thrown for a loss as a politician? 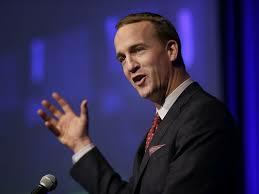 But as a long-time admirer of Peyton, I’m a little disappointed that he’s not running for the Senate. I think he may be just the sort of quarterback we need in Washington, and I don’t mean to play for the Redskins. He would be a leader that even Tennessee Democrats could support. After all, Peyton has something in common with former Tennessee Democratic Senator and Vice President Al Gore. Like Al, Peyton knows what it’s like to lose in Florida. And after shaking things up in the Senate, he could even become President Peyton Manning. He would probably paint the White House orange. But it’s not going to happen, and we really shouldn’t be surprised. The one thing Peyton was never able to do as either a Vol or an NFL quarterback was run. Karachi Call Girls: The Karachiescorts69 girls are the best girls in Industry. Our Each girls has a different body type. Our Karachi Escorts are willing to give you the best service. Every girls of our team will satisfy you on everything. chaltom: RUN PEYTON, RUN! PLEASE.